From your favorite footwear to daily groceries, every little thing is just a few taps away. Thanks to the rapid emergence of eCommerce stores for completely transforming the shopping trends. Today, there are innumerable eCommerce stores offering a gamut of products and services for potential purchasers. But, it is not happy ending always post the sales happens and goods are dispatched. There is definitely more to this side of the story. With the colossal increase in the volume of supplied products, eCommerce stores are often under the threat of product returns. And this particular aspect gives birth to an alarming situation for eCommerce traders. Gone are the days, when free shipping was nothing more than just a growing trend for online business. The present-day scenario has a different story to narrate in this context. Quite inevitably, free shipping gives your customers the flexibility and perfect opportunity of making returns too. 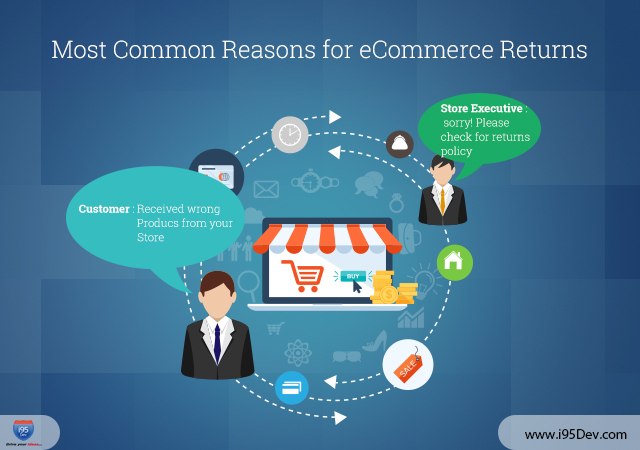 And no matter how hard an eCommerce store tries, returns are inevitable. Although it is easy to point the fingers at shoppers, one of the major reasons for eCommerce returns is the eCommerce stores themselves. The disparity between the actual product (images) and descriptions provided in the online catalogues proves to be the most potential reason for customers returning merchandise. Refer to statistics again and it will help you comprehend the situation better. In reality, almost 65% of the purchase time, it is the merchants responsible for the returns and not the customers. A great way of avoiding this debacle is by providing comprehensive product descriptions as well as pristine clear product images to potential consumers. Another potential cause of eCommerce returns is the receipt of the wrong merchandise. At times, merchants deliver the wrong products to their customers, which prove to be a major incentive for product returns. Statistics states that the percentage of goods returned for this reason is about 23%. However, there is an effective escape route, in this regard. By training their employees and improving certain clerical systems, eCommerce stores can keep the event of wrong shipping at bay. If you are one of those passionate eCommerce store traders, then replace your position with that of your customers’. Perceive the entire situation from their viewpoint. How would you exactly feel if the product ordered by you does not match up to your expectations? Well, returns will be inevitable under such circumstances. Delve deep into the nuances of the issue and you will discover that incorrect product specifications and half-hearted descriptions are the major reasons behind this particular consumer behavior. And it is the merchants who can plan an escape strategy from such issues. It will be unjust to hold the merchants responsible always. There are times when irrational purchase behavior from the customer’s end initiates the process of returns. Moreover, there are eCommerce vendors offering free shipping facilities on returns too. And quite a few customers will reap the advantages of such policies and purchase more than their intended amounts; because they weren’t planning to buy in the first place. According to the popular return trends, it is the clothing materials and fabrics returned the most. Customers are often unable to nail down the correct size and measurements and end up making the wrong purchases. And this is where the brick-and-mortar stores are still giving the eCommerce shops a run for their money. By providing proper measurements and sizing charts, merchants can reduce the rate of eCommerce returns for clothing materials (order multiple to try and return others). Developing a proper understanding and perception of the product is also of paramount importance for making successful online purchases. There are items that require viewing from various angles. The absence of such viewing experiences can create a misconception regarding the appearance of the product. And the consequence is quite evident. The product gets returned straightaway. Whenever there is an eCommerce return, merchants have to pay upfront costs, which is not a feasible way to carry out the business. But that should not prevent you from offering easy return policies to your customers because it has a dramatic positive impact on your business. If you have generous return facilities for your customers, then almost 80% of them will remain loyal to you. Next up, we will look at what are the key elements to consider when facing product returns, from a customer servicing point of view. Happy Reading till then!